In dreams, from my kids, nature, in other artistry! Right now, I am stuck on the crossover twist. Its an element that works well in so many designs and I keep adding it into my own. I try to offer as many sizes as I can that will stay true to the character of the design and will be appreciated. 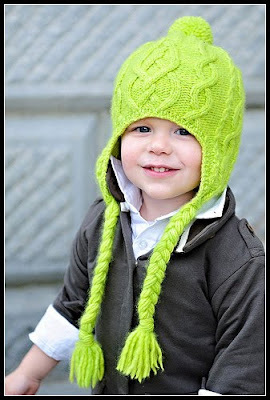 Many of the Tot Toppers hat designs are also available in adult sizes. I'm just starting to offer sweater designs, and the same will apply. I love looking at others work! I think we all give and take from each other visually, but I also don't pore over instructions written by others. 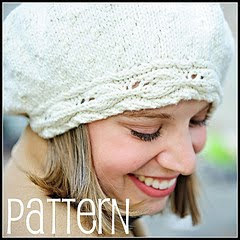 I try to make my patterns as accessible as possible, even to beginner knitters. One problem I've run across now that I'm working with retailers and selling wholesale is that I really am constrained in how long the pattern can be. If I'm not writing out every little detail, its because I know I've got to fit it on the page properly, not because I want to cut out less experienced knitters. All in all, it depends on the complexity of the design. It is different for every pattern. 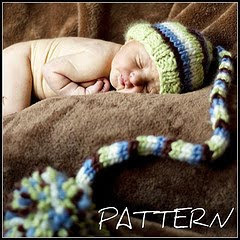 I usually try to have at least 2 other knitters to a "test knit" for me prior to publication, but not always. So far, I have knit everything I've designed at least once. One thing I really take pride in is the photography in my patterns. I use professional photographers and I think it makes a really big difference in how well the pattern is perceived, and the clarity of the garment. I think the investment is totally worthy. I haven't *yet* but its on my agenda for the very near future. I'm actually a graduate student, so I haven't had to make the decision yet as to whether I'll be able to design full time. Once I get closer to graduation, I will be putting everything to paper and seeing where that takes me. I've been going with the flow and utilizing opportunities that are presented, I haven't actually looked at any models. For me, that's where it started. I don't really know that I would have gotten into designing in the same way were it not for the Internet. Yes, I actually have several that I work with. They are phenomenal and I couldn't work without them. I don't sleep :) Truly, this is something I have to work on! I tend to over commit myself and there are nights where I am up really late, or I serve the kids chicken nuggets since I haven't slaved over the stove like I might have wanted to. I have an addictive personality, and its really hard for me to put down a project sometimes. But, my husband keeps me pretty grounded. I find myself always wanting to explain things away. I'm working on learning to nod & digest it instead! I know I have a lot to learn and therefore, I don't have that hard of a time when advice comes in form of criticism. What tends to bother me a little more is when people undervalue my work, but, I think this is a very very common feeling and something you just learn to live with. I've been self-publishing for almost a year now, I'm not yet at a place where I would feel comfortable saying that I support myself. However, I would say things became steadier around the 6 month mark. At that point, I was at least in the black and I could reasonably expect that the costs of each new design would be earned back. Never take your customers for granted, customer service is so important! Try not to let rejection get you down, there will be lots of it (whether its in publications, or people who criticize a design). You have to learn to be a little forward in order to promote yourself, no matter how uncomfortable it may seem. And, don't be afraid to seek opportunity, whether it be in form of yarn support or a publication. How do I access your interviews with other designer such as Janet Szabo? This come sup in a google search but your blog only displays the most recent interview with no apparent links to the earlier ones. I couldn't link to your email. If you go to the bottom on the blog page on the right hand side you can click on older posts to go back.